Jay Kennedy, the editor in chief of King Features Syndicate and a prominent comics editor and historian, died on Thursday, March 15, drowning during a riptide incident while on vacation in Costa Rica. He was 50 years old. Kennedy was born in 1956 in Toledo, Ohio and was raised for the majority of his childhood in Ridgewood, New Jersey. He displayed an artistic inclination at an early age, according to his brother, Bruce Kennedy. "In elementary school he loved to build Lego sculptures way beyond other kids. He built a copy of the capitol building in D.C., and custom-built a scale model car and won a competition in Washington, D.C. He made a 3-4 foot paper mache lion in around 6th grade. I think he may have sketched some in elementary school, but his real drawing efforts started in Junior High, I believe. I remember he loved Astro Boy, and drew him and Silver Surfer and other comics." "We met in ninth grade and went all through high school together," the artist Scott Roberts wrote in a posting to the Drawger.com site. "Even then Jay was an exceptional talent. He had a gift for sculpture, and I remember the paper mache Nixon caricature figures he made, hands held high in characteristic 'V for victory' pose. I thought then that Jay would become an underground cartoonist (it was the early '70s after all)." His brother remembers one instance of cartooning in the manner of a Kennedy favorite, Gahan Wilson. "Our dad was an encyclopedia editor at the time. In Gahan Wilson-style, Jay made a single-panel poster for Dad of my dad and his boss. His boss was holding a volume on whose spine read "Go to Hell." The caption read something like, 'Bill, I think we have to change the catch-line on this.'" High school also saw the beginnings of what Bruce Kennedy describes as his brother's "intellectual, sociological and cultural interest in the '60s." Kennedy studied sculpting and conceptual at the School of Visual Arts (SVA) in New York City. He then moved onto graduate work at the University of Wisconsin at Madison. While in Wisconsin, he studied sociology and befriended future comic book industry figure Milton Griepp. He was by this time a fervent fan of underground comix, a natural outgrowth of his interest in the '60s and in art. Griepp spoke of Kennedy's passion in a memorial article at ICv2.com. Jay was already hard at work assembling his "best in the world" collection of underground comics, and I was working at Wisconsin Independent News Distributors, a "distribution co-op" that distributed underground and mainstream comics, among other pop culture paper products of the day. He came to W.I.N.D. to find the source of the underground comics that were distributed at record stores, food coops, and head shops in Madison because he wanted to make sure he had them all. We quickly bonded over our mutual appreciation of the art form, and had many pleasant afternoons trading and discussing the exciting work that we both loved from artists like Robert Crumb, Art Spiegelman, S. Clay Wilson, Denis Kitchen, and many others. Following graduate school, Kennedy wrote about comics during that first period of sophisticated -- albeit intermittent -- interest in the medium from both mainstream publications and serious magazines that arose out of the culture. According to King Features, Kennedy's clients included New Age Journal, Heavy Metal, New York, The IGA Journal, and Escape. His positive relationships with journalists and comics historians grew out of those experiences, and he would later become arguably the best known and most widely quoted of all the men and women working in comics syndication. 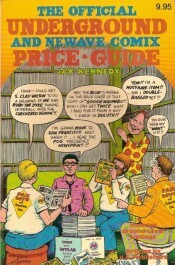 Kennedy's interest in and research into underground comix came to its greatest fruition in 1982 when his own Boatner Norton Press released the 273-page, illustrated book The Official Underground and Newave Comix Price Guide. The book contained a number of essays on items of historical interest, subjects that included key artist S. Clay Wilson, women's undergrounds and Leonard Rifas' EduComics. One of those sections' titles, "The Art Form that Wouldn't Die," hinted at Kennedy's conception of the importance of underground comix as an art movement as much as a social or cultural moment. The inclusion of "Newave" comics indicated an acknowledgement that those kinds of comics continued past their '60s/'70s heyday. "Because I did not get up to full speed until after the comix movement had peaked, histories of comix have typically mentioned me in just a sentence or two when they mention me at all," a grateful Leonard Rifas says. Through his meticulous research and the wide scope of comics covered, he also brought to the project a great deal of authority. "I laughed when I saw the word 'Official' in the title of his index," comics historian Craig Yoe told Comics Reporter. "What could be 'Official' about the wild, wooly, obscure world of underground and small press comics? It could be official because Jay was behind it and Jay was the King of documenting that world." Rifas remembers Kennedy's rationale in making the book a price guide. "Jay explained to me that the only commercially viable way to publish his database would be as a price guide, and he was correct. As I remember it, we came to see eye-to-eye on that one within a minute or two of discussion." For Rifas and many others, the positives far outweighed the negatives. "Although I have read an argument charging the Price Guide with subjecting those subversive underground comix to 'a subtle form of reification,' I'd put the accent here on 'subtle.' I have never heard of an underground comic being 'slabbed' (and I hope I never do)," Rifas says. "If Jay Kennedy had not assembled this document, most of this information would have been lost altogether, and we'd be left with only auteurist histories that focus on just the big names of that small movement, and falsely malign the rest, the vast majority of comix creators, as misogynistic imitators and uninspired shlockmeisters." Kennedy's book was also meaningful in terms of describing the field to still-working cartoonists. Matt Feazell wrote to the Comics Journal message board, "When his book came out it was like Woodstock for small pressers. It was the first time we looked around and realized how many of us there were. It was a defining moment in small press." Talk of an updated version of the Guide can be found in comics magazines as early as 1986. Kennedy was believed to have been working slowly towards that goal for years, and was still pushing towards a new edition in mind at the time of his death. "Over the years Jay was continuing to update his Underground Guide, a landmark resource, the Bible on the subject, one I still use regularly," historian Paul Gravett told Comics Reporter. "Like many others, I kept hoping that this would someday see print." Starting in 1983, Kennedy began a stint as the cartoon editor of Esquire magazine while continuing to write and acting as a freelance consultant for a variety of comics- and humor-related endeavors. At Esquire he not only worked with Lynda Barry as her editor but according to the cartoonist in a 1988 interview worked on at least some of her strips as a co-writer. One of Kennedy's prominent freelance assignments was as guest editor on the European Humor issue of National Lampoon released in 1985. He also served as a cartoon consultant for People and Lears Magazine. According to a 1989 article in the Comics Journal, it was during this period that Kennedy began to do work that prepared him for his eventual King Features position, analyzing publications and putting cartoonists in touch with them according to need. Paul Gravett published Kennedy and learned about North American comics through him. "Jay wrote 'The Kennedy Report' in Escape 5 in 1984, the first of a one-page column on the latest and best from the North American small press. At the time he was Cartoon Editor on Esquire. One illustrated highlight of his first column was Yummy Fur, which introduced me to Chester Brown and led to his being published in Escape 7." According to Gravett, the interest was mutual. "We used to mail each other our favorite new small press comics, as he was always keen to see what was coming out of the UK. Escape 7 saw his second and last column, before the revamp of the magazine to a larger format. Jay continued to keep in touch, helping me contact Lynda Barry who debuted in Escape 8 in 1986, and emerging talents like Richard Sala and Rich Rice." In 1988, Kennedy moved from Esquire to another Hearst enterprise by becoming deputy comics editor at the venerable comics institution King Features Syndicate, home of Popeye and the Katzenjammer Kids, and of the major syndicates the one that had taken the smallest role in the 1980s resurgence of interest in the comics page. The understanding when Kennedy came on was that he was to eventually replace then-current editor Bill Yates. King Features executives had apparently become aware of Kennedy when he began to conceive of starting his own syndicate in competition with the majors. The early days at the syndicate were tough. "Jay was in his early 30s when he started at King, and signaled a changing of the guard in the Comics Art department," said longtime co-worker and friend Jim Keefe. "From my vantage point most of the old guard, rich with experience, were pretty unsure of the newcomer. It seemed like everything he did was questioned. His title of 'Deputy Editor,' with its inherent cartoon imagery, didn't help. I remember after one of King's social functions Jay related the story of how all these editors and cartoonists were getting together for a group shot and they called him over -- a moment of acceptance -- until he discovered they just wanted him to take the picture. Jay had a self-deprecating sense of humor and said this story with a smile on his face. To Jay's credit he took all this in stride and went about learning the ropes and forging his own path." 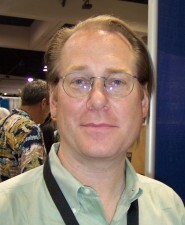 Kennedy became the comics editor in 1989 upon Yates' retirement and was awarded the editor in chief designation in 1997. While his time in the position was not without incident -- a decision in 1992 to take Bobby London off of the Popeye feature he had been doing since 1986 brought with it a certain amount of public controversy, including an accusation of censorship -- most of the cartoonists during his long run responded to his personal touch. Wes Hargis of Franklin Fibbs/Little Fibbs told Comics Reporter, "One thing that comes to mind is a time Jay and I had a disagreement about something. We set a phone appointment and during the call his willingness to listen to my point of view and work out something totally caught me off guard. Up till then he was still a big syndicate suit." Kennedy became known for his solicitous approach to the sometimes brutal submissions process, including as many personal responses as he could even when the material had no chance of being syndicated. He was also an exacting editor of strips in syndication, believing in working with talent early during syndication on an almost strip to strip basis and then leaving them to find their own way after the first dozen to eighteen months. Jim Keefe, who later moved out of King's offices and into a cartoonist's role on the Flash Gordon feature, described Kennedy as an editor to Comics Reporter: "That first year I did the strip Jay was very hands on. He'd make me do changes to everything from artwork to word balloon placement, it could be infuriating at times when deadline pressure was mounting. Jay could be rather blunt giving a critique, but it was never mean-spirited. It all had to do with telling a better story. After that first year I was on my own." * helming the company during a time of massive industry-wide shrinkage in terms of circulation and number of papers, including the loss of several multiple-newspaper cities which brought with them not only additional space for clients but a basis for competition between papers for new features. * while Kennedy enjoyed several hits, two stand out for the skill in which they were presented and nurtured: Patrick McDonnell's Mutts and the Jerry Scott/Jim Borgman effort Zits. Unlike strips that came out of left field from fresh-faced new talent, the kind an editor ordains and then rides for all they're worth, or a niche strip developed to hit a target market and build into mainstream consideration from there -- Kennedy had those, too -- Zits and Mutts were broad efforts reaching for a mass audience, and the work of already-successful cartoonists. They were the comics equivalents of prestige pictures. Neither one was a sure thing, and both called for a significant early push. According to Keefe, Kennedy gave McDonnell significant latitude designing Mutts' sales presentation packet. The result distinguished that strip and helped it gain traction with buyers. Scott and Borgman's first six weeks of selected material were so strong others have pointed to them as a new industry standard. * Kennedy was a fine steward of traditional King offerings like Beetle Bailey and Blondie, but his overall track record was compellingly diverse. Among his varied achievements were making an unlikely hit out of a conservative political strip (Mallard Fillmore), significant attention to female creators (Between Friends, Six Chix), Tina's Groove, being the first to offer strips with Christian themes in their mission statement (Wildwood, Heaven's Love Thrift Shop), signing the syndicate's first non-North American creator (Kieran Meehan of A Lawyer, A Doctor and A Cop), working with one of the best artists from the great '80s/'90s wave of alt-comix cartoonists in Terry LaBan (Edge City), presenting maybe the best short-lived strip of this decade (Franklin Fibbs), and putting effort behind format-stretching strips (The New Breed, Six Chix again, Triple Take). * this is more of a personal observation, but it seems Kennedy never overvalued concept at the expense of execution. While his editorial office frequently came up with concepts or ideas, it never pursued them past a certain point unless Kennedy could get the talent he wanted. He was long interested in a manga-style strip but never found the creators he wanted. At one point he offered the Hernandez Brothers the keys to Apartment 3-G; they declined. Many editors would have pushed such ideas through via a second or third or fourth choice; Kennedy's launch record indicates he mostly just moved on. * Kennedy helped guide King Features' current on-line comics strategy and its focal point DailyInk.com, making certain the syndicate took advantage of a new revenue and exposure stream while trying not to anger traditional clients in a way that would have an effect on the syndication-figure bottom line. King's subscription-focused mix of new and old strips should prove versatile in terms of future development, and won't needlessly propel the syndicate out of current, positive relationships. As a key figure restoring class and potency to one of the city's iconic publishing institutions, Kennedy's personal life had a New York storybook flavor as well. He married Sarah Jewler, a former commune resident and fixture of the New York press community eight years his senior, a former Village Voice staffer who went on to become New York's managing editor. She was later diagnosed with a rare blood disease and died on January 5, 2005. Kennedy's friends noted both before and after his passing just how hard that loss hit him, and how difficult the months that followed were for the editor. News of Kennedy's passing last week was greeted with shock and dismay by those in comics who had come to know Jay Kennedy as both an important industry figure and as a friend, and even those for whom Kennedy remained a mysterious figure. As Triple Take's Scott Nickel wrote in his personal on-line journal, "This is sad and shocking news. I, like everyone else, am completely stunned." Wes Hargis told Comics Reporter, "When I met him in person I thought 'He's so young.' It's the same thing I thought when I heard of his passing." He was a familiar face to several who never learned his name. Kennedy was a fixture at major comics gatherings from the Museum of Comic and Cartoon Art's summer festival to San Diego's Comic-Con International -- as a comics fan, a person with years of friends and friendly acquaintances to see, and more recently as part of a growing comic strip creator presence at such events. Kennedy's impact and the difficulty many of his friends and colleagues had in trying to sum up a life in the hours and days following the man's passing were perhaps most eloquently put into words in a note from the underground artist Gary Panter. Jay was a friend and a gentleman. These are random fragments. There is a lot more to say about Jay. Hopefully someone smarter than me will say it on his behalf. He was a believer in the egalitarian creative vision of the early hippie culture. In junior high school he was a prize winning custom model car builder and there are models in storage boxes at his house -- beautifully detailed. He was trained as a sculptor and was very capable as demonstrated by the precise and massive cascade of stone steps he installed at his home in Montauk. He was very much in love with his departed Sarah and was having a hard time get over her loss, but he was working on it. He didn't give up, but soldiered on. He had a nice giggle and I will miss him very much. Jay Kennedy is survived by a mother, two brothers and a sister. Funeral arrangements are pending.